Many people enjoy driving, but only a few appreciate the effects of fuel injection. Many people will watch a football game, but only a few appreciate the contribution of the left tackle. Likewise, many people enjoy playing games, but only a few care about the perfection of every detail of the gaming experience. In many ways this obsession with every last detail is the best definition of a hobby – what defines the collector of luxury games is not just a love of playing but an interest in everything that goes into the final feelings of pleasure and enjoyment. 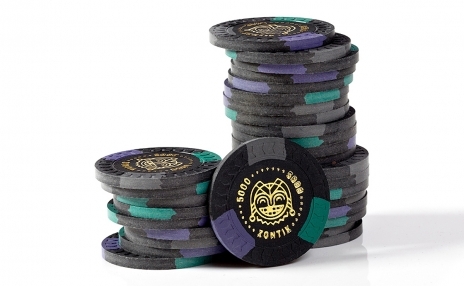 As a case study of this love of detail, let’s look at Zontik’s new line of Aristocrat Poker chips. In a previous blog entry I named Poker chips my number 3 physical game component. Even though you could play Poker without chips if you wanted to, the Poker chip is an essential part of the whole experience for many players. Terms like “cashing out” have even become integral to our culture and no cinematic Poker game would be as exciting without a big stack of chips in the pot. So just using chips at all, as opposed to cash or buttons or whatever else is handy, is already a statement about how much you value the total aesthetic experience of Poker night as opposed to just the thrill of guessing probabilities and calling bluffs. 1) Clay – There are benefits to plastic and ceramic chips but, almost unanimously, serious chip collectors prefer the attributes of clay and clay composite chips. Sound and feel are often cited as distinguishing features of the clay chip. Clay chips release a satisfying thud when they hit the table or one another as opposed to the sharp clank of ceramic and plastic chips. The difference is hard to describe in words but instantly recognizable. Listening the clay chips being shuffled by your opponents is almost soothing while a few seconds of plastic chips hitting one another can drive you crazy. Clay chips also have a gritty feeling due to the material and this natural feel is appealing to players as opposed to the artificial feel of plastic or ceramic. But if we are really being honest about clay chips the greatest appeal is probably entirely psychological. Serious Poker players prefer clay chips because that’s what they find in Las Vegas so those clay chips can mentally transport you from your basement or gameroom to the glitzy Poker rooms of the world’s most famous casinos. Even moreso the natural feel of clay reminds many players of old Las Vegas or even gambling in the nineteenth century. A great Chess player will read books about the history of Chess and a serious fan of Poker will appreciate this connection to the game’s roots. 2) Denomination – Poker chips are used to represent some amount of money. The amount of money is the denomination of the chip. Many chips are made without a denomination printed on them so that they can be used for any type of game, but many experts prefer the denomination be on the chip. Why? The main reason is simply to do with the amount of mental focus one needs to be good at Poker. The last thing a serious player wants in the middle of a big decision is to have to mentally recall the value of the red chips. This is especially true for players who play multiple games a week in different locations with different chip sets. Denominated chips are actually no less flexible than those without denominations, they simply move all the mental work of recalculating value to the end of the game when you cash out. And, much like the appeal of clay, denominated chips are the standard in Las Vegas and, thus, give your game a feel of authenticity. In addition to simply having the value printed on the chip, it’s also important that colors be chosen that are quickly recognizable. No one wants to accidentally raise the bet because they mistook a blue chip for a green chip. Zontik has carefully chosen the colors and unmistakable marked the denominations to appeal to the serious players who worry about details such as these. 3) Design – The recent surge in popularity for the game of Poker has also seen a surge in a related group – Poker chip collectors. If you play enough hours of Poker you will see a huge variety of chip designs and graphics and since most Poker players spend quite a bit of time between hands handling their chips, the beauty of these designs becomes quite important. Zontik chose to go with an entirely original look, yet one that harkens back to the history of Poker chip design. Suited chips – those that incorporate hearts, spades, diamonds, and clubs in their design – are quite common and popular because wherever you find Poker chips you’ll also find a deck of cards. Zontik’s chips play off of this common characteristic by borrowing images from the standard card deck but adding Kings, Jacks, and even Jokers along with an overall geometric design that looks to the future even as the symbols remind us of the past. Uniqueness and attractiveness are the two qualities, of course, that chip collectors value the most and Zontik’s exclusive design aims for just that. However, the unique design also has a more serious intent. It’s not uncommon for a friend of a friend of a friend to show up for Poker night and that unknown person might be the type that brings along a few extra chips in his pocket and then tries to cash them. Fear of such a thing has led many Poker night hosts to design their own custom chips, sacrificing artistic beauty for security. With Zontik’s design and limited production you get the best of both worlds – the appeal of a professional design along with the safety of a chip that no cheat is likely to have on him. 4) Craftsmanship – A large part of the appeal of board games and card games in our digital age is their physicality and the connection to real human beings. Zontik, then, has sort of tapped into this spirit with the chips themselves by insisting on using real craftsmen and more physical techniques for the production. A beautiful mass produced chip with machine printing is still divorced from the producer in some way, but these chips bear the mark of the craftsman since each chip, to some extent, is unique. These chips are hotstamped, an old form of printing that presses a hot metal stamp into the clay one chip at a time. The result is beautiful gold foil lettering but also minute variations that remind the expert collector of the human being who crafted the chip. A high end chip carefully crafted by hand and made of clay does the same thing a cheap plastic chip does in a game of Poker – represents a sum of money. Yet, a game of Poker with generic plastic chips with no design that clink together annoyingly is not at all the same as a game of Poker with beautiful clay chips. If you are the type of person who understands that statement then you are the type of Poker player these chips were designed for.